First impressions are important. 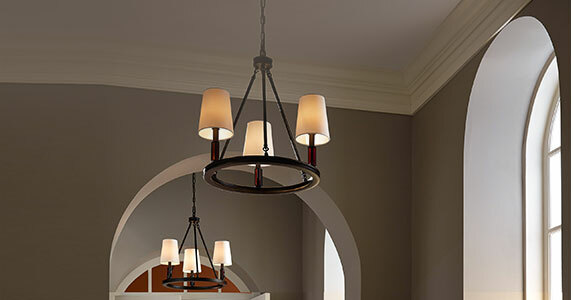 Our brilliant selection of hallway and foyer lighting and fixtures, including chandeliers, pendants, sconces and more, will leave a lasting one with everyone who visits your home. Delight guests with a dazzling choice in lighting. Add a dash of flare and radiance with your lighting. Accentuate your hallways and foyer with light and wamth. Sleek, unobtrusive and ideal for highlighting artwork or unique architectural elements. Perfect lighting accessory for the table in the hall or foyer. Versatile task, ambient or accent lights and fixtures with a touch of style. Hallways should be softly lit. Sconces, pendants or chandeliers work best. Chandeliers in a hallway should hang at least 9' above the floor. For optimal lighting, place wall sconces 6-8' apart.